26 posts categorized "NewPath Meetings"
Dan Pink speaks in Toronto on April 5 2010 at U of T - Rotman on "Drive: The Surprising Truth About What Motivates Us"
Daniel H. Pink, Lecturer on Economic Transformation and the New Workplace and Best-Selling Author of Free Agent Nation and A Whole New Mind. He’ll make a presentation based on his new book. Drive: The Surprising Truth About What Motivates Us (Riverhead Books, 2009). The session will adjourn at 6:15. Dan is a friend of NewPath Network and his book "Free Agent Nation" motivated the beginning of our group. Written 10 years ago, the dream of independent free agents is still on the minds of many small business owners. We are trying to organize a group of NewPath'ers to attend the event at a discount. Please RSVP here if you plan on going and I will see if I can get us a cheaper rate. Don't miss our next NewPath Network Meeting on October 7th at the Centre for Social Innovation. Not only will there be some great networking with interesting folks, but we've got professional sales trainer Aileen Mens from Sandler Training. For details and to register online, click here. June 2009 NewPath meeting is the "best deal in town"
Where else can you go to a free networking meeting and meet such great people? We had 19 reservations at last night's NewPath event and the following people showed up and had a terrific time networking and getting to know each other at a level that most other networking event don't even come close to. I think all of our guests will agree -- you had a great time didn't you? And it was free. Best deal in town. Here are the folks who came out -- feel free to comment and add your own details in the comments below! Jacob Grobman, President, JRG International Inc.
March 2009 NewPath networking meeting a success, even with only 7 people! The March 2009 networking meeting had a much smaller, intimate crowd than usual but the people that come out are interesting as usual. We had to turn down the speakers a bit in the upstairs room at Starbucks but after we got our introductions together we had a chance to meet some very interesting folks. Here's a bit of a rundown of who came out to the networking evening. James Barker - James is a really great business analyst, accurate and professional - James is currently doing work on a contract for the Ontario government. Martin Cleaver - Martin Cleaver - Martin is one of Toronto's most prominent Wiki consultants, and is Publicity Chair for WikiSym, the International Conference on Wikis and Open Collaboration. His business interests are rooted in the field of Knowledge Management, and he is actively interested in Value Network Analysis. Martin runs two meetup groups: Knowledge Workers Toronto and Toronto Wiki Tuesdays. Sheila Goldgrab - GOLDGRAB LEADERSHIP COACHING Sheila is a leadership coach who has worked for 13 years in the coaching space. She works with professionals and executives to improve their leadership brand. I am encouraging her to put together a talk at a Fall 09 NewPath meeting that will describe the different networking roles that people play inside their organizations. Stelian Moldovan - Stelian is a Microsoft developer and provider of hosted Exchange and Sharepoint services. Martin Obern - Martin has the best job in the world - helping small businesses create marketing strategies without spending a fortune. mirosuite fits any budget and many verticals. Whether you sell your products online or in a store, need to manage your inventory in a stockroom or a warehouse - or you need to manage your teams and clients effectively and within tight project constraints, mirosuite can provide you a 360 degree view of your business, maintain your financials, streamline processes and ensure that you provide exceptional service to your customers. Even though the evening had a small group, the networking was interesting and lively. Thanks for coming out and look for our April event with Cheryl Rankin. Way back in 2002/2003, NewPath networking meetings were held at the Starbucks at Yonge and Davisville. Supposedly this is Toronto's oldest Starbucks, or at least one of the first ones. The upstairs meeting room was a perfect place to hangout and get to know each other better. So this month, NewPath returned to that location last night and packed Upstairs @ Starbucks. Usually our networking meetings have about a 10% no show rate. A few registered people didn't show last night as well, but instead we had many more come out that had not registered on the formal invite. So instead of the usual 10 we had 18 -- and that's always nice to see. I hope we keep up the trend, as we always have the nicest and most experienced people come out to have a good time. Doris from Organic Mechanic brought lovely scones that she makes which are made without wheat! They were a yummy treat, made with 100% Canadian organic spelt flour. Thanks Doris! Tom Otvos has started a website to help indie bands get some buzz online at mybandsite.ca. Tom is a terrific programmer - I hadn't seen him in almost 10 years - we worked at EveryWare Development when I first immigrated to Mississauga from the U.S.
Erika Bailey runs The Clic Effect -- facilitating change management through constructive human interaction. Thanks for coming out to your first event Erika! 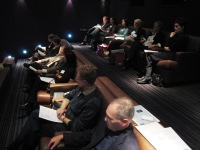 Check out the full list of invitees and their websites at http://newpathnov2008.eventbrite.com. If you want to add a plug to your organization feel free to add them to the comments below. 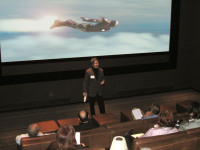 On October 29, 2008 NewPath held the inaugural "Movies that Motivate" event. We screened "Iron Man" featuring Robert Downey Jr. as Tony Stark (aka "Iron Man") and Gwyneth Paltrow as Pepper Potts, Tony's gorgeous and loyal assistant. The response was terrific! 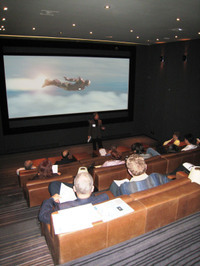 We sold out the 25-seat Hazelton Hotel Silver Screening theater. The two million dollar facility was the perfect setting for our guests to enjoy the movie in full luxury, enabling them to think deeply about the business-related themes in the movie. The leather seats comfortable, the 32 foot screen was bright and sharp, and the sound system was sublime. Each time Iron Man took off I could feel the seats shake in a most subtle way, not too loud -- just the way the movie was meant to be seen. Emmanuel Lopez (Motivatorman.com) addresses the group below, with "Iron Man" on the screen in the background. Here's the handout that Emmanuel put together to motivate the discussion for our guests. And here are some testimonials from our guests. Several guests sent us kudos right after the event on Wednesday night! "Thanks again for hosting the event last Wednesday. I really enjoyed it -- beautiful theatre, good dialogue ... and, of course, it's hard to go wrong when you're showing "Iron Man" for this type of thing!" - Roger P.
"Good evening Alex, thank you for your email. I was out of town for three days and wanted to comment on the Wednesday evening event. I had a great time. What a great concept!! Movies that Motivate. It was unique and very inspiring. Please let me know when you are having your next event. I will definitely let my friends and colleagues know about New Path." - Dorothy G.
"Many thanks for the Iron Man movie last night....it was amazing...great night. Love the concept of the small theatre...Never been so comfortable." - Peter E.
"You sure know how to throw a movie night. Alex, it was a wonderful evening and all on a Wednesday. How great is that! I certainly enjoyed the movie (one I probably would not have rented myself - and look what I would have missed). And the discussion after, some great thought provoking insights. It was a fantastic luxurious venue and very professionally and thoughtfully organized. Thanks so much Alex, and count me in for the next one." - Doris P.
In the words of Tony Stark after his first experimental flight over the Afghanistan desert, "Movies that Motivate was..."